Skin Care, Bath & Body. 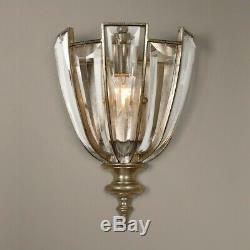 Uttermost Vicentina 1 Light Crystal Wall Sconce - 22494. This Product Is On Sale For A Limited Time! Product Code: UT22494 Stock Status: In Stock & Available. Shop Our Store With Confidence! Product Features: An Elegant Sconce Of Beveled Crystals Enhanced With Burnished Silver Champagne Leaf Finish, Presents A Modern Update Of Traditional Elements Able To Blend Into Many Interior Looks. Finish/Frame: Burnished Silver Champagne Leaf Finish With Beveled Crystal Details. Made of Iron 47%, Crystal 50%, Poly 3%. (1) 60W TYPE B Bulb(s). Uttermost's Sconces Combine Premium Quality Materials With Unique High-style Design. With The Advanced Product Engineering And Packaging Reinforcement, Uttermost Maintains Some Of The Lowest Damage Rates In The Industry. Part of the Vicentina Collection. Overall Dimensions: 4.75"(D) x 9"(W) x 12.62(H). Bob and Belle Cooper founded The Uttermost Company in 1975, and it is still 100% owned by the Cooper family. The Uttermost mission is simple and timeless: To make great home accessories at reasonable prices. Inspired by award-winning designers, custom finishes, innovative product engineering and advanced packaging reinforcement, Uttermost continues to deliver on this mission. For over 30 years, Uttermost has enjoyed steady growth with over 200 employees working in its Rocky Mount, Virginia factories totaling 600,000 square feet. Uttermost is proud to support many of the world's most prestigious home-furnishing customers with its products and services. Uttermost believes its success is largely based on its commitment to three key principles: Proving superior customer service, maximizing product value through great design and sharp pricing, and treating its employees, sales representatives, and designers as partners in business. Please note that this product is designed for use in the United States only (110 volt wiring), and may not work properly outside of the United States. We are a Boston-based store dedicated to providing you the very best products at the lowest possible prices while delivering the absolute best in personalized customer service. Simply put, we are a small company that specializes in big service. Unlike the big box stores and super-centers, we aim to provide you a specialized shopping experience that caters to you as an individual. Our dedicated staff will answer your calls without having to deal with automated prompts and robot customer service. Are you a designer or builder with a large project? Thank you for visiting ShopFreely and don't forget to "like" us on Facebook for even more designer tips, sale notifications, and valuable coupons. Our contact information can be found by clicking on our name, "Shop_Freely", at the top of the page and then clicking "Contact Member". It's just another reason why you always shop freely with ShopFreely! At ShopFreely, we stand by our products and our customers. The few exceptions include unsealed mattresses, assembled or modified products, and clearance merchandise which will note this within the product details. The Return Authorization Number allows the warehouse to identify your return when it arrives and helps us credit you as quickly as possible. Please note that the original packaging must always be used when returning product(s) back to us. At ShopFreely, we know how important it is to provide our customers with a safe and secure shopping experience. We want all our customers to be free from worry and have peace of mind while shopping at a trusted and reputable store. We treat the security of your personal information with the utmost care and use only the most state-of-the-art 128-bit hacker-safe SSL encryption to secure all data we collect at ShopFreely. How do you know when your data is secure? The item "Uttermost Vicentina 1 Light Crystal Wall Sconce 22494" is in sale since Wednesday, July 15, 2015. This item is in the category "Home & Garden\Lamps, Lighting & Ceiling Fans\Wall Fixtures". The seller is "shop_freely" and is located in Multiple Locations. This item can be shipped worldwide.